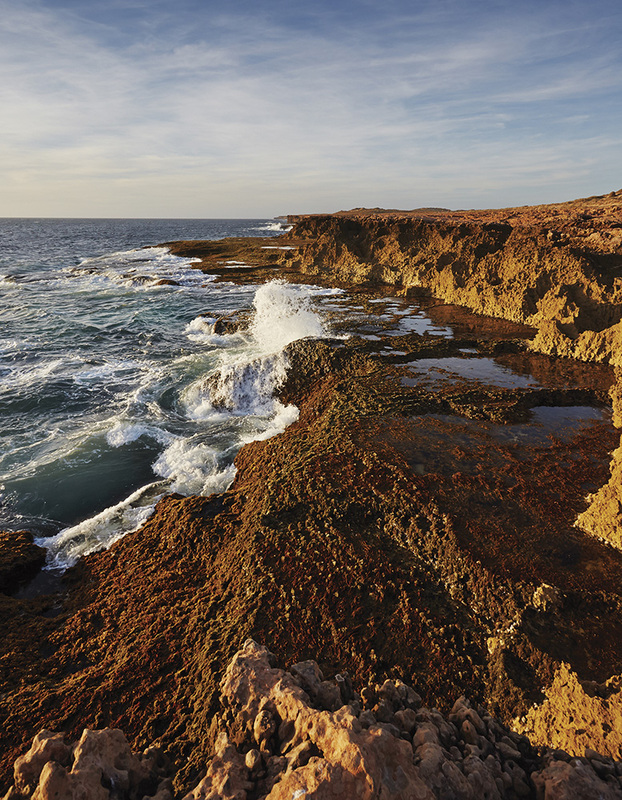 The marine environment of the Gascoyne Bioregion represents a transition between the fully tropical waters of the North West Shelf of the North Coast Bioregion and the temperate waters of the West Coast Bioregion. Offshore ocean temperatures range from about 22°C to 28°C, while the inner areas of Shark Bay regularly fall to 15°C in winter. The major fish stocks are generally tropical in nature, with the exceptions of the temperate species, pink snapper, whiting and tailor, which are at the northern end of their range in Shark Bay. The coastline is characterised by high cliffs in the southern half changing to fringing coral reefs in the north. Coastal waters are generally high-energy in terms of wave action due to the strong trade wind system. The Exmouth Gulf section of the Gascoyne Coast Bioregion is seasonally influenced by extreme tropical summer cyclones, while the Shark Bay end of the Bioregion receives infrequent cyclones, but is affected at times by river outflows from inland cyclone-based summer rainfall. The limited local rainfall comes mostly from the northern edge of winter storm fronts. The waters off the Gascoyne Coast are also strongly influenced by the unusual southward-flowing Leeuwin Current, generated by flow from the Pacific through the Indonesian archipelago. This tropical current becomes evident in the North West Cape area and flows along the edge of the narrow continental shelf where, coupled with low rainfall and run-off plus the north flowing Ningaloo current, it supports the highly diverse Ningaloo Reef marine ecosystem. The Gascoyne Coast Bioregion has been identified as one of 18 world ‘hotspots’ in terms of tropical reef endemism and the second most diverse marine environment in the world in terms of tropical reef species. The outer area of the large marine embayment of the World Heritage-listed Shark Bay is also influenced by the warm winter current. The inner waters of the embayment are hypersaline, owing to the high evaporation and low rainfall of the adjacent terrestrial desert areas. The sea floor of both Shark Bay and the continental shelf is typically sandy compared to Exmouth Gulf, which has more mud areas and greater turbidity. The Ningaloo reef in the north of the Bioregion is the largest continuous reef in WA and is one the most significant fringing reefs in Australia. The Bioregion also has some areas of mangroves, mostly in Exmouth Gulf, while seagrass beds are located in a number of areas. 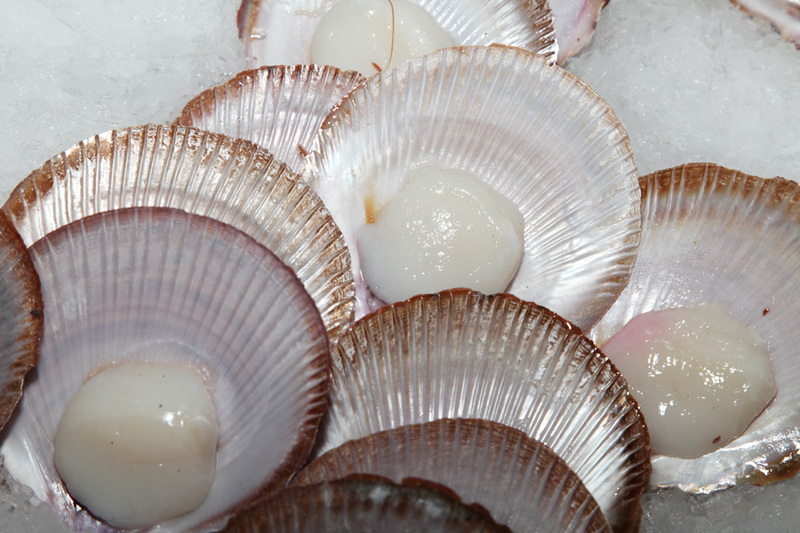 Bay Prawn, Exmouth Gulf Prawn and Shark Bay Scallop fisheries – landing combined catches valued in the range of $40 – $50 million annually. These trawl-based fisheries have operated sustainably in the region since the mid-1960s and are internationally recognised as ‘best practice’ in terms of both management and research. Only a relatively small number of the approximately 1400 species of fish inhabiting this bioregion are targeted by commercial fishing activity. The Gascoyne Demersal Scalefish Fishery (GDSF) and Shark Bay Beach Seine and Mesh Net Fishery have operated in the bioregion since the 1960s and provide a significant proportion of the snapper and whiting catch for the State. Originally this fishery only targeted pink snapper but it has developed in the past decade into a broader fishing sector, taking demersal finfish species including emperors, cods and deeper water species such as goldband snapper. The Gascoyne includes part of the Mackerel Managed Fishery (which extends the NT border and is reported on in the North Coast Bioregion chapter) with this area having lower annual catches compared to more northern areas. The main invertebrate species captured by fisheries in the Gascoyne Bioregion include a number of penaeid prawns, scallops, blue swimmer crabs within the two main embayments of Shark Bay and Exmouth Gulf plus deep sea crabs in the offshore region. The region also includes some other small commercial fishing activities for finfish including the marine aquarium fishery which collects small numbers of a wide variety of species but is not permitted within the Ningaloo Marine Park or any waters closed to fishing. There is also a small beach seining fishery within Exmouth Gulf. 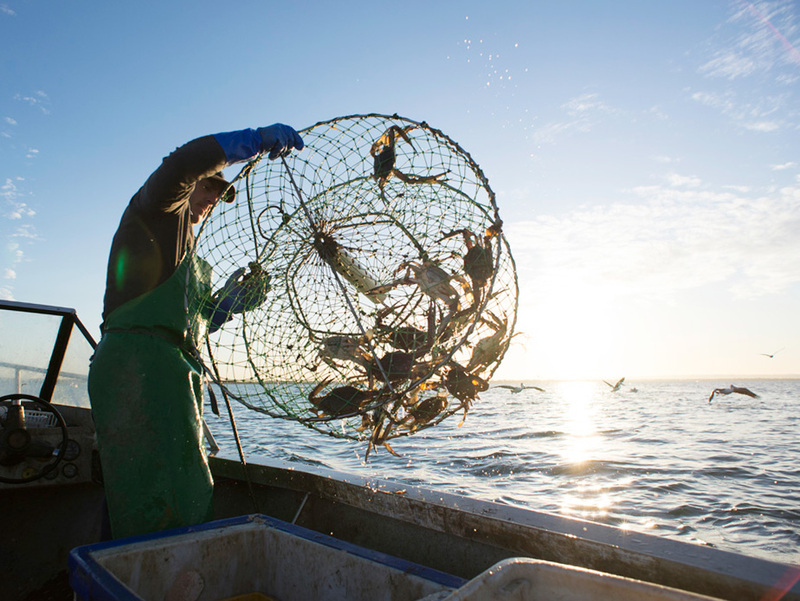 The fishery for blue swimmer crabs which operates throughout the waters of Shark Bay had grown in the last decade to be the largest Australian crab fishery until recently affected by environmental issues. Other minor commercial fishing activities for invertebrates operating in the bioregion include collecting silver lipped pearl oyster which is used in pearl culture, though most effort is focused in the North Coast Bioregion. The special features of the Gascoyne Coast Bioregion, coupled with the warm, dry winter climate and accessible fish stocks, have made it a focal point for winter recreation by the Western Australian community. Fishing during this season is a key component of many tourist visits. A full range of angling activities is available, including beach and cliff fishing (e.g. Steep Point and Quobba), embayment and shallow-water boat angling (e.g. Shark Bay, Exmouth Gulf and Ningaloo lagoons), and offshore boat angling for demersal and larger pelagic species (e.g. off Ningaloo). 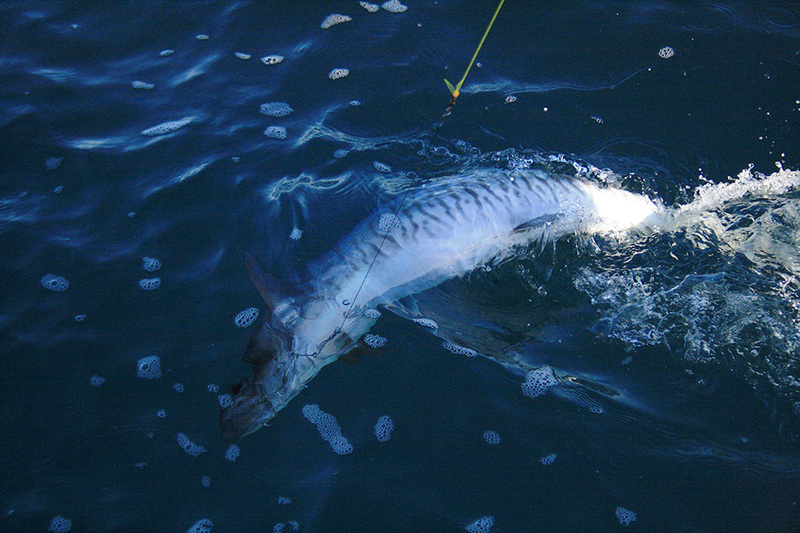 Recreational fishing is predominantly for tropical species such as emperors, tropical snappers, groupers, mackerels, trevallies and other game fish. Some temperate species at the Northern end of their ranges, such as (pink) snapper, tailor and whiting, provide significant catches, particularly in Shark Bay. Improved infrastructure (e.g. sealed roads) has led to increasing levels of domestic and international tourism to the Gascoyne . Enhanced access to coastal waters via new boat ramps (e.g. Bundegi, Coral Bay, Tantabiddi) and camping sites/facilities and the sustained popularity of recreational fishing also contribute to pressure on local fish stocks. This trend of increasing levels of recreational fishing effort and catches is also related in part to the recently increased levels of regulation and constraint on recreational fishing in the West Coast Bioregion south of the Gascoyne Coast Bioregion. Aquaculture development in the Gascoyne Coast Bioregion is largely restricted to the production of pearls and pearl oysters in the major embayments. Hatchery production of oysters is of critical importance in this region, driven by the irregular and therefore unreliable recruitment of both large species of pearl oysters in the wild. Hatcheries in Carnarvon and Exmouth supply significant quantities of Pinctada maxima spat to pearl farms in Exmouth Gulf and the Montebello Islands, while several hatcheries supply juveniles of the blacklip pearl oyster Pinctada margaritifera to the bioregion’s developing black pearl farms. The Gascoyne Coast Bioregion is a focal point for winter recreation by the Western Australian community. 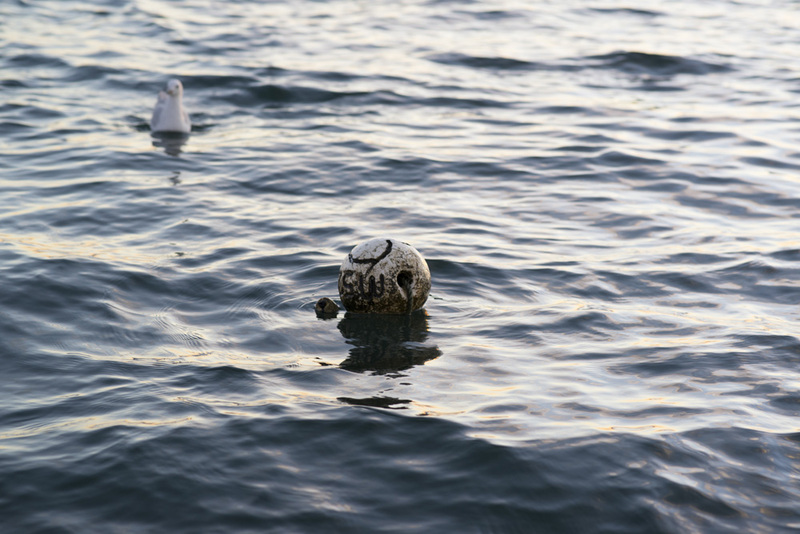 Apart from its scenic beauty, the main attraction of the coastline for tourists is the quality of marine life. The region supports extensive scuba diving and snorkelling activities, particularly inside the coral lagoons of Ningaloo. Specialised eco-tourism activities include whale shark and manta ray observation at Ningaloo and dolphin and dugong viewing in Shark Bay. Fishing is a key component of many tourist visits, and a full range of angling activities is available.